In which I shed many tears over the genuine love shared between a couple of friends. So, wow. Yeah. That episode was phenomenal. Easily the best 25 minutes Ore Monogatari!! has done all season. Definitely among the best episodes of the season. Subtle, adorable, melancholic, touching. Special. I’ve cried over Suna moments before, but this…this was something else entirely. Even more than the climactic conversations and moments of the episode, the thing that stood out most to me in this week’s Ore Monogatari!! was the melancholic undertow that was present almost ubiquitously throughout the episode. I mean, of course there were the usual forays into silliness (like Takeo’s job at the muscleman café), but even some of the more lighthearted scenes (like Suna laughing over old memories with Takeo) were shaded by the darker hints of something bothering Suna and the obvious dynamic of change generated by Suna passing over the physical locations tied to those memories to Takeo’s birthday planning for Yamato. 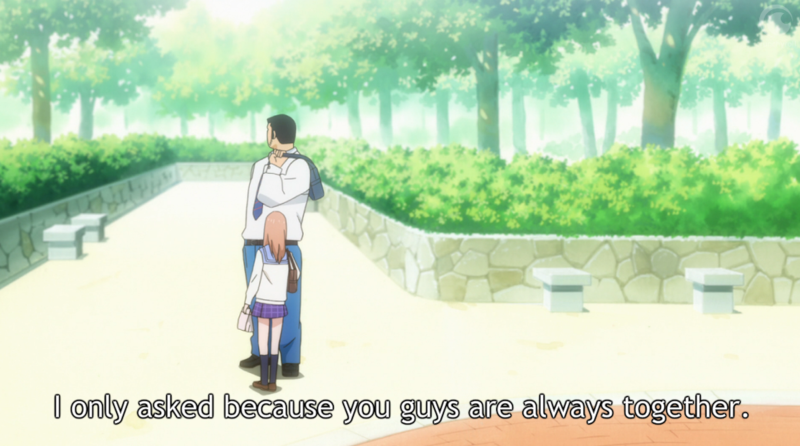 It’s been teased before, but this episode effectively revealed that yes, Takeo is the only friend Suna has. This young man, who is so perceptive and thoughtful and caring, is all but alone in the world besides his oft-absent mother, college sister, sickly father, and one great friend. Which is kind of sad—although it doesn’t seem like Suna really shows all that much interest in trying to reach out to anyone who isn’t Takeo. That’s the backdrop established by the haunting red light of sunset at the beginning of this episode, and I couldn’t get it out of my head the whole way through. With the episode constantly feeding us visuals emphasizing Suna’s solitude and loneliness despite his spoken protests to the contrary, that subdued somberness filtered into the way the rest of the episode came across. Contrasted with the very “together” bliss of Takeo and Yamato’s new relationship, Suna’s isolation is all the sadder—and in his desire to see his one friend happy, he’s sacrificing his own need for companionship and support. As much as I want to decry Suna’s resistance to Takeo’s offer to come with him to the surgery as unhealthy, I can’t quite get there simply because his reasons for doing so are so incredibly relatable. In a situation where things are already outside of his control and where he already feels bad, the last thing he wants is another thing to make him feel worse—that is, taking away the happiness of someone else. Ideally, I’d love to see Suna able to be happy without having to vicariously apprehend happiness through Takeo, but life, I guess, isn’t always that easy. 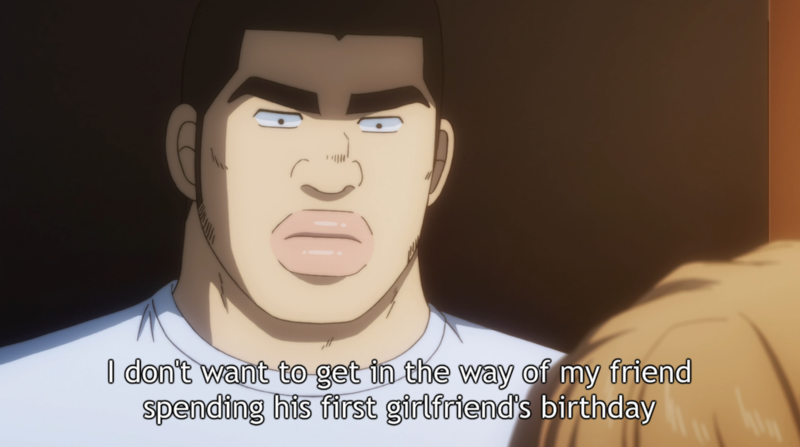 Nowhere in the episode is this as painfully obvious as during Takeo and Suna’s brainstorming session for Yamato’s birthday schedule. 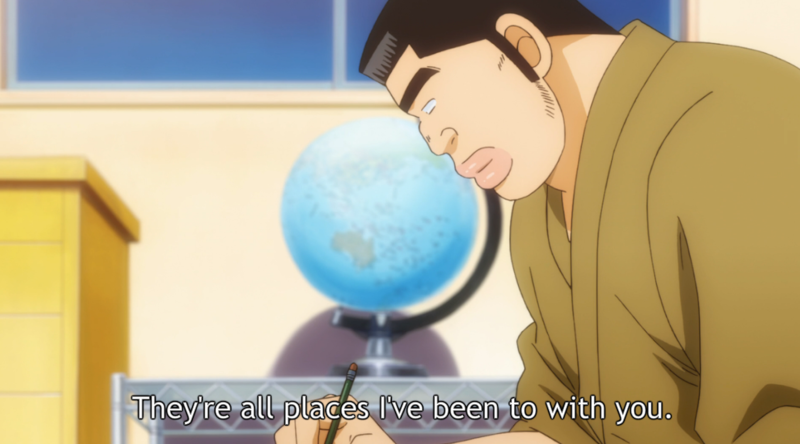 Here, we have Suna symbolically passing off his own treasured memories with Takeo to allow his friend to plan the best birthday ever. 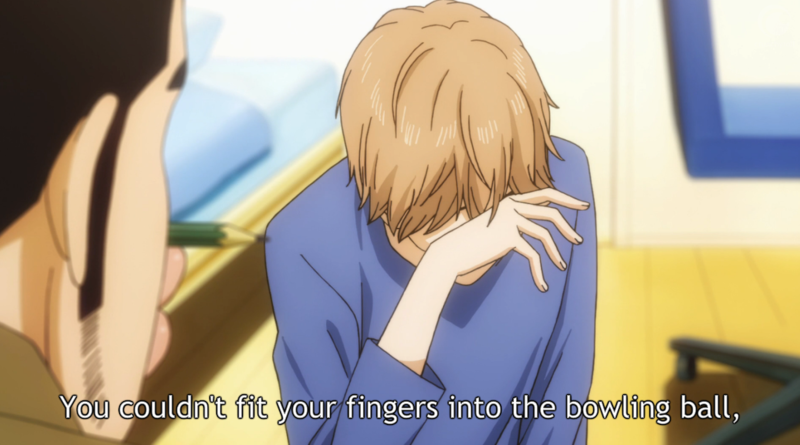 In the midst of his father’s potentially terminal hospitalization, Suna’s still able to laugh over the memory of Takeo palming a bowling ball or getting stuck in a construction whole—at the exact same time as he generously gives those memories away to Yamato. We’ve had a lot of great Suna moments thus far, but none struck me as so genuinely heroic as this one. You guys know well enough how sentimental of a person I can be, and the thought of allowing the memories you once shared exclusively with a special person to be, in a way, appropriated by another…well, let’s just say that it would be really difficult for me. The other painful element of all this is how little Takeo remembers about any of this. Suna doesn’t seem to be bothered, but there’s something profoundly sad in watching Suna saying, “Hey, remember this that we did here?” and Takeo going, “Eh, no, not really,” each time. 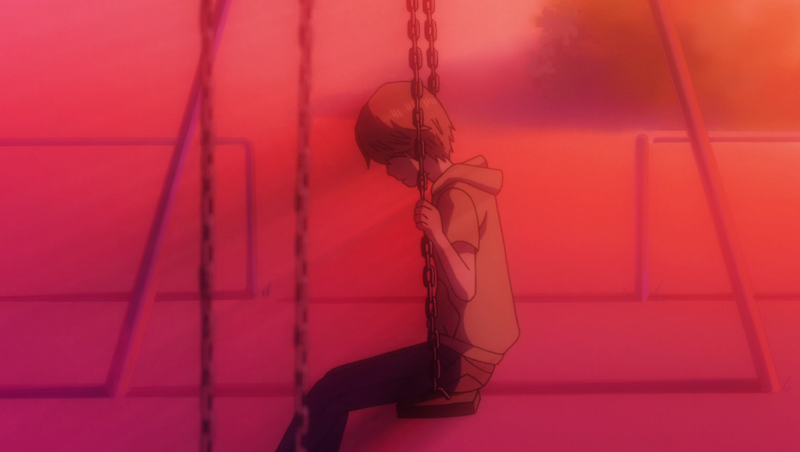 I wouldn’t go so far as to say that Suna remembers these things because they’re directly related to Takeo (or indirectly so), but the disparate relative weight they each give to memories serves again to highlight the fact that there’s still a divide between these two friend, close as they are. And while it’s not the sort of situation where you’d blame either one of them—Takeo for being so focused on the immediate, or Suna for not making clear what’s important to him—it again circles back around to that feeling of melancholy running underneath the silliness of the surface. 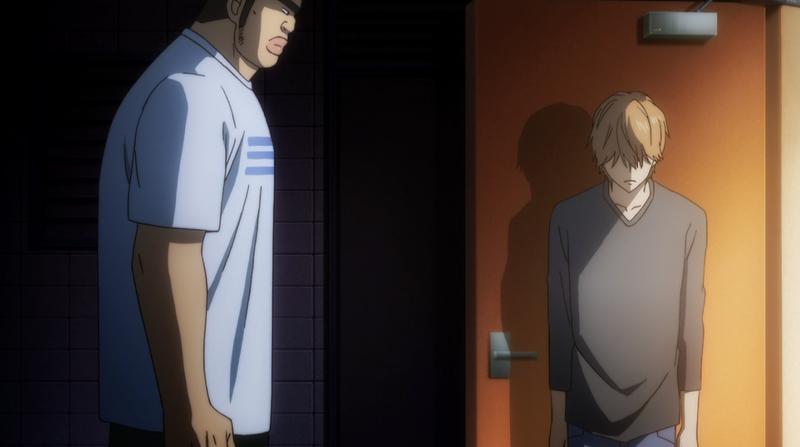 Of course, all of this climaxes as Takeo dashes to Suna’s door and confronts his friend, and once again we see the differences in their priorities and personalities manifest in stark contrast. 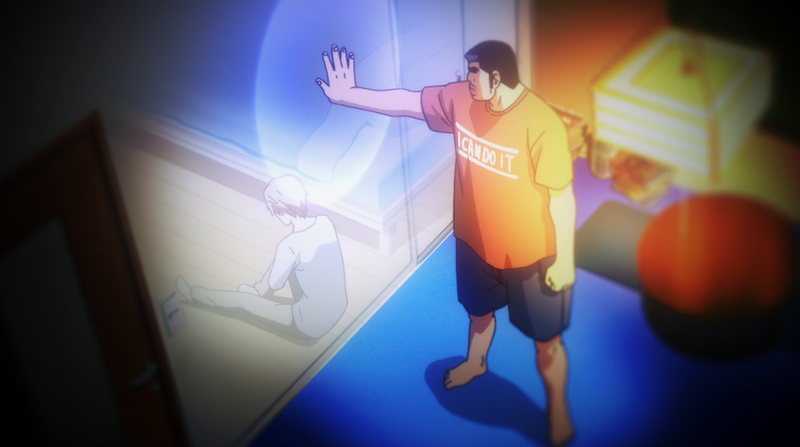 Takeo’s willingness to cancel his plans with Yamato to be at Suna’s side is both selfless and a bit selfish—selfless because his willing to forgo something he really wants to do for Suna’s sake; selfish because he hasn’t even stopped to think about whether or not that’s what Suna wants. 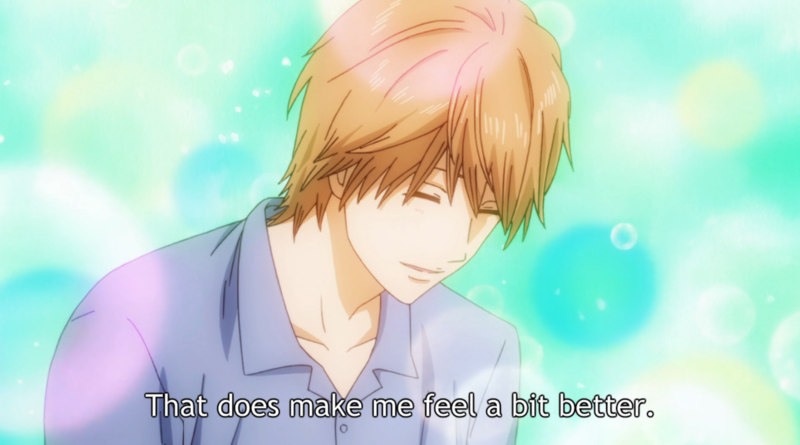 Suna, likewise, embodies both selflessness and selfishness in his desire to maintain Takeo’s ability to birthday with Yamato and to use Takeo’s happiness as a source for his own comfort, respectively. It’s fascinating that two people manifesting the same abstract qualities can arrive at such different conclusions based on their personalities and motivations. 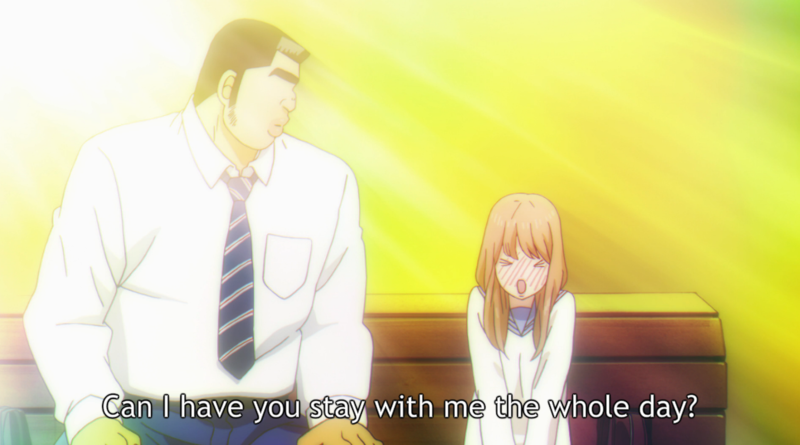 The upshot of all this is really just to point out that Suna and Takeo clearly care for each other a whole heckuva a lot, even if they express that care in radically different ways. But you don’t need me to tell you that. You can just see that in the episode. I suppose the only thing I really haven’t touched on yet is the whole life-death theme that was sort of trickling downstream throughout the episode. If I’m being honest, Takeo’s reflections—”People are born into this world”—didn’t do a whole lot for me besides continuing to characterize the simple profundity of his thoughts. Until we see the end of this mini-arc, I’m not convinced the duality of Yamato’s birthday versus Suna’s father’s illness has been adequately grounded to say anything meaningful to the audience. This, of course, doesn’t preclude it from saying something important to Takeo and, frankly, I think that might be better anyways. I think he’s already being taught a lot by this situation, and the fact that this arc deals with Suna, rather than Yamato, throws the English translation of the title, My Love Story! !, into a new light. But I’ll leave that one for you to ponder yourselves. Ore Monogatari! !Episode 8, My Love Story! !, Ore Monogatari!! @Suna “sacrificing his own need for companionship and support.” I think the points you address in this paragraph are important. Suna was obviously relieved to hear that Takeo isn’t throwing the birthday for his sake; this would clearly have bothered Suna. But I’m not sure this is the whole issue. If this was me, for example, I’d actually be relieved if a close friend had something else to do and wouldn’t come along. I’m a fairly extreme introvert and with stressful situations I deal better alone. I wouldn’t want anyone along for the hospital visit, because their presence would make me more nervous. 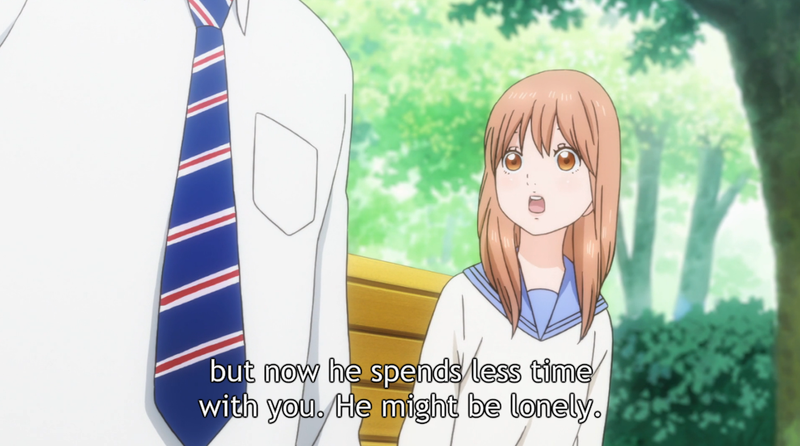 That’s especially true for someone as straightforward and direct as Takeo: see how Suna talks about his memories? 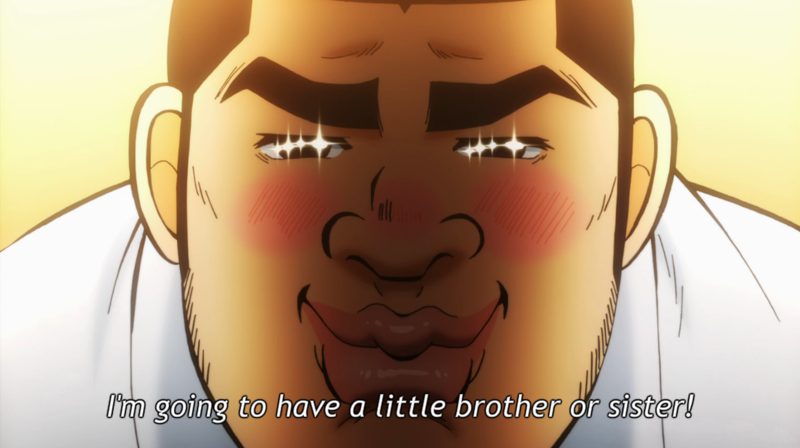 What Suna needs is distraction, but Takeo is living in the here in and now. He’d probably not have much to say, except for the occasional “it’s going to be all right”, and that can wear an introvert down. I have no idea if the show actually plays it like that, but it’s at least a possibility. I’d certainly prefer that take to the show using the occasion for Takeo to be distracted thus – once again – triggering Rinko’s uncertainties – which they then resolve on the same day with a joint hospital visit. I could easily see the show go down that route. @Life and death: I don’t think the key opposition for this scene is Birthday vs. Hospital visit, but Suna possibly losing his father and Takeo gaining a little brother (remember why his mum was in the hospital): the hospital as entrance and exit to life. Rinko’s birthday is sort of the top of the triangle, built on this base, I think. It’s the recurring celebration of life (and, incidently, you can continue to celebrate a person’s birthday even after they die if you really want to). Also, I think Takeo’s “People are born into this world,” was a sort-of realisation that spatial proximity is an accident, and that simply living side by side for a long time doesn’t guarantee understanding. Takeo was musing that he’d been living aside Suna for a long time, now, but there are still things he doesn’t know. The connection is, I think, this: when you hear you’re going to have a sibling, you’ll get these warm, affectionate feelings. But you don’t really know the person yet, do you? So what do relationships based on proximity mean? By contrast, the relationship between Takeo and Rinko came about because of Rinko’s deliberate effort. It would have been very easy, otherwise, for them to pass each other by. So, in the end, I think “people are born into this world” is more about how we meet people than about life vs. death. But we shall see. I notice I’ve typed “Suna” throughout the post, but I used first names for both “Takeo” and “Rinko”. 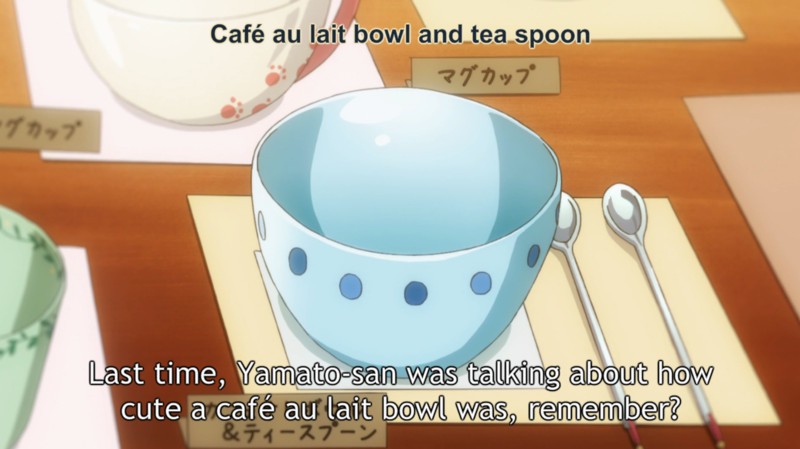 I can’t even remember Takeo’s second name, but I was constantly tempted to write “Yamato” (simply because that’s what I keep hearing in the show). It didn’t ever occur to me to refer to Suna as “Makoto” (until now, and I’m too lazy to edit, even though I like consistency of naming in my posts). I’m not sure what that means, but I find it interesting. It’s interesting that you see Yamato’s birthday as the top of the triangle! I think I was considering it as a main pillar simply because it was the starting point for the theme, chronologically (“Yamato, I’m glad you were born.”). As for Takeo’s reflections, I definitely think you have to keep it at a “sort-of realisation.” Our friend definitely isn’t thinking about abstract stuff like spatial proximity. 😛 For him, I definitely am more on the side of him simply musing about an obvious truth because that’s who he is—the type of guy to consider the depth behind something simple and obvious. I don’t necessarily see it connecting directly to Suna, but I do see where you’re drawing the lines. Literally no one calls Suna by his first name in the show. I’d imagine that’s why you’re typing his last name (plus, it’s short enough to sound like a first name). Yamato’s birthday is the plot mover – the source of the conflict that allows you to explore the theme. But it’s not the theme itself, I think. Similarly, neither birth nor death alone constitute the theme. I think it’s too early to tell what theme will be, or if there will be a coherent one, rather than an improvisation of motives. What I’m seeing here is that Takeo and Suna’s past together has an influence on how Yamato’s birthday will go down, which in turn gives Suna something to take his mind off things he can’t change. I’m can’t quite see yet how Takeo’s prospective sibling figures in with this, except that it makes the hospital more than just a place of sadness. And I have yet to fully understand what being alone at the hospital means to Suna. Finally, I’m never quite sure how much sense I’m making, since I’m thinking while I type (and delete stuff and shift it around and…). Also: what you say about me using “Suna” makes sense, but then the question rephrases itself into why did I combat my instincts to use “Yamato” and wrote Rinko instead. Hardly anyone in the show calls her that either (or am I misremembering?). Beautiful episode that embodies the story at its best. I particularly love the use of grounded comedy as a great counter-balance to the emotional swells without hindering from it, and there’s not a single gag that didn’t make me smile/laugh; Cupid Takeo, dorky ‘good dad good mom’ quip, Takeo-Mom interaction, Takeo’s ridiculous itinerary, the Bro Cafe, and that underwear line. Man, the underwear line…it takes a lot to make me laugh and tear up at the same time, you know, and the way it sounded so authentic just adds to it. Speaking of authenticity, there are just so many subtle subversion the show pulled off. I really, really, like how the author made Takeo not your typical dense protagonist who Doesn’t Realize Anything Ever; he doesn’t know exactly what is it, but he knows something’s wrong with Suna (same pattern with the previous Yamato conflict, I just realized), and it felt so much more authentic that way. And the way that he actually decided not to force Suna into revelation before being snapped to action once he actually heard the news… it’s great. I mostly agree that the life and death theme is only meant to reflect Takeo’s maturing mindset, but it felt really effective (and again, authentic) to me. It’s not there (merely) to illustrate the clash between Yama’s birthday and Suna’s dad, but as Takeo cycled between the birthday, his mom’s news (I love the way it’s casually weaved into the storyline, btw), and the bad news, he becomes aware of the cycle of life, of how good things start and how they inevitably end. This is probably the first time in his young life that he’s come into this kind of…heavy real life situation (rejection by middle-schoolers doesn’t really count, no), and the whole thing is meant to reflect his maturing mindset. So yeah, it’s not a Big Theme for this particular story arc that the author wanted to hammer into the audience, it’s there to add nuance and texture to Takeo’s growth as a human being. I love it. I doubt it’s going to be addressed further in the next ep either, as it will probably zeroes in onto the friendship aspect. A good friend might respect and go along with what someone wants, but a great friend will know what someone NEEDS and act accordingly. Oh, yeah! I’ve been thinking about how weird it is that Takeo’s mom just announces her pregnancy and then the show really doesn’t make much of it! It’s…well, not procedural, but extremely calm. I mean, sure, Takeo has his blissful reaction and tells Yamato, but it almost amused me that something so incredibly unusual for anime (I mean, seriously, how many pregnant ladies are there in anime??) was treated with such normalcy. It’s both funny and kind of poignant. I’m going to take an opposite tack here… Though, thematically, it mostly succeeded in the end -the actual execution left much to be desired. We’ve seen Suna distancing himself before (with no more motive than to avoid being the third wheel and to give the lovebirds some space), so him doing so in the early parts of the ep just seemed normal. They’ve shown us very little of his home life, so the reveal about his father just felt too much like a deus ex machina to me, a bluntly forced method to get at the central themes of the episode. In the same way, we know (as it’s been abundantly demonstrated) that Takeo is socially awkward, but not deliberately insensitive. Once he’s been lead to the water, he drinks and thinks deeply – but he has to be lead or at least nudged. Yet they felt the need to make this a central (and slightly overblown) theme yet again, detracting from the flow of the narrative. 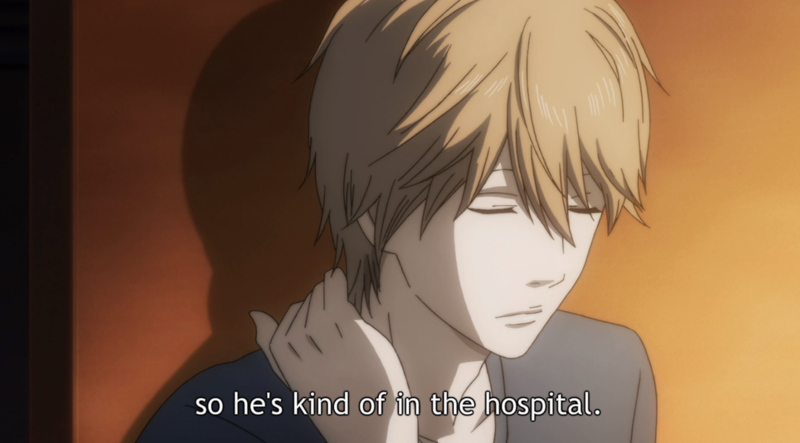 Suna is a main character too, as deserves to be treated as such… but here he felt more like a plot point. As we’ve said before, they’re both unfettered and trapped by the new ground they’re treading = and this ep felt like they were eschewing that freedom and hanging about the fence of their old pen. It’s the closest they come to a by-the-numbers to date “Takeo dense, check. Yamato gets all swoony, check. Suna, Suna… oh heck what are we going to do with Suna?”. Hmm very interesting—obviously, our thoughts on the episode diverge rather significantly haha. I suppose I might have agreed with you had not the red scenes at the beginning been so vividly impressive to me. There’s no doubt in my mind that they greatly impacted the way I felt and thought about the rest of the episode, but of course digging all that out is probably impossible, heh. I don’t have much to say about the episode because you pretty much covered it. It was a great episode. I look forward to its conclusion in the next episode. I think I just talk about Chihayafuru a lot in general. I’m glad you thought it was good, even if it didn’t appeal to you that much.